Do not rush. Always start with QEMU testing, then add a real device which is well supported by LAVA. Purchase and integrate one of the standard known devices. Take time to learn what is required to automate a DUT. Avoid rushing into adding your own new device type. When you have a LAVA instance which has successfully run a few dozen test jobs using QEMU and a standard known device, then consider how to integrate a new device-type into LAVA. The django admin interface is a core component of the django framework. Elements can be added for particular implementations but, fundamentally, the operation of the interface is the same as other django sites. The appearance of the menu is determined by the version of django installed on your system. The style changed substantially in django 1.9, so images of the interface itself are not included here. Changes within the administration interface and changes made as a superuser through the UI are tracked through the History elements of objects in the database. When viewing a specific element (for example a single Test Job or a single Device), click on the History link to view all changes relating to that element. There is also a link back to the UI view of the same element. the organisation, layout and content of the django administration interface is subject to change with upgrades to django itself and these changes are outside the control of LAVA. The django administrative interface offers links back to your LAVA instance if the Sites element is modified. (The default django value is example.com.) Navigate to the Sites element in the administrative interface and modify the domain name and display name. Once complete, links like View site and the View on site button on certain pages of the interface will link to the correct location in your LAVA instance. It is tempting to jump straight in with your one-off special device which nobody else has managed to automate yet but a fresh install needs to be tested with a known working configuration. Setting up known working devices and learning how to modify the first job is essential to deciding how to best configure a new device. It is also recommended to setup another known device type which is similar to the device you want to add as there are different steps required for certain types of device. This first QEMU device can be configured on the existing worker which is always available on the master. Subsequent devices can be added to other workers and devices can be shuffled between workers, subject to limitations of physical connections. QEMU requires only a minimal device dictionary. Test images for use with QEMU are readily available and relatively easy to modify. Creating a gold standard image and Create a device in the database. If an existing template does not exist, a new template will need to be created. 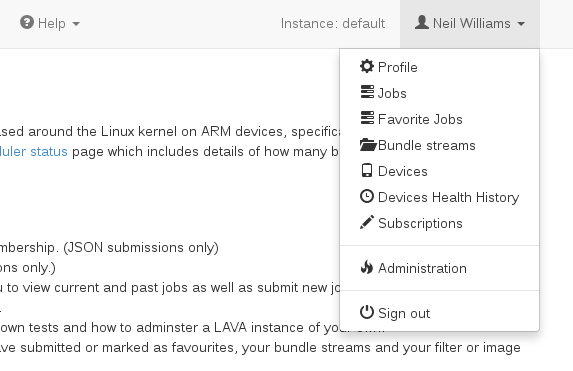 You can then either use the web admin interface or the lava-server command line to add device types. In order to use the web admin interface, log in to the LAVA instance and click on your username to see the Profile menu. The django administrative interface is accessed from the Administration link in the profile menu. Scroll down to the group labelled LAVA_SCHEDULER_APP. The only value needed for the QEMU device type is the Name, just check that Display is the default: enabled. Now Save. Descriptive fields like Architecture name, Processor name, CPU model name, List of cores and Bit count cannot be set on the command line. Navigate back to LAVA_SCHEDULER_APP and select Devices and Add Device. Select the QEMU device type from the list. Select the worker from the list. Set the Device owner (typically one of the superusers). Your first device should be public. Ensure that the device is enabled as a Pipeline device. It is also possible to copy an existing device as a new device with a new hostname. See lava-server manage help devices for more options. The device dictionary must extend an existing template. The architecture (arch value) is not set in this device dictionary. This allows this device to run test jobs using files for any architecture supported by QEMU. The MAC address needs to differ for each device of this type across all instances on the same subnet. The available memory for the virtual machine is set in megabytes. This can be changed later to balance the requirements of test jobs with performance on the worker. Line ordering within the device dictionary is irrelevant, although it is common to put the extends line first when storing the dictionary as a file. This dictionary does not include a setting to use a tap device which means that this device would not support a hacking session inside the virtual machine. Setting up a bridge is out of scope for this documentation. Creating a device dictionary for the device to export and modify a device dictionary, Updating a device dictionary to import a device dictionary into the database for use with a new or existing device, Checking your templates for help with types of devices other than QEMU and Device type templates for help with how the device dictionary works with the device-type templates. Once updated, the device dictionary is added to the Device view in the administrative interface under the Advanced Properties section at the base of the page. The core principles remain the same as for QEMU, the main differences are in the way that the device dictionary is needed to provide a wider range of settings covering power control, serial connections, network details and other values. Writing Health Checks for devices - each time a new device type is added to an instance, a health check test job needs to be defined. Growing your lab, including How many devices is too many for one worker?. Templates usually exist for known device types because an existing instance is using the template. Often, that instance will be Linaro’s central validation lab in Cambridge which is accessible via https://validation.linaro.org/ . It is recommended to keep the device dictionary jinja files under version control. The templates are configuration files, so if you modify the default templates, those need to be under version control as well.